Respiratory Protective Equipment Market size was more than USD 5.5 billion in 2016 and will witness 7.2% growth during the forecast span. Rapid industrialization mainly in Asia Pacific has been a major factor contributing towards respiratory protective equipment market owing to its widespread applications in maintaining safety against toxic substances including powdered chemicals, solvents, gases and sprays. These equipment are available in the market in several forms including facepiece, visors, helmets, hoods and masks. Strong growth indicators in construction, chemical manufacturing, aerospace, metal fabrication, textile, pulp & paper and food industry in the region are likely to help attain promising gains to market size over the projected timeframe. Stringent safety standards by regulatory agencies including Occupational Safety & Health Administration (OSHA) mainly in North America and Europe will contribute in attaining substantial respiratory protective equipment market size in the coming years. Moreover, strict threshold levels proposed by Center for Disease Control and Prevention (CDC) and World Health Organization (WHO) for employees in healthcare industry will also help attain promising gains in the respiratory protective equipment market size in the coming years. These equipment helps in providing oxygen to patient through masks attached with air supply in critical health situations or utilized by doctors, patients and visitors for avoiding contact with contaminants in the environment. High product prices in the industrial sector, for instance, oil & gas, mining, construction, etc. is likely to hamper the overall market size in the coming years. However, improving regulations and safety standards across several industries including construction, medical & healthcare, mining, oil & gas, etc. is likely to generate plentiful opportunities to the respiratory & protective equipment market size by 2024. 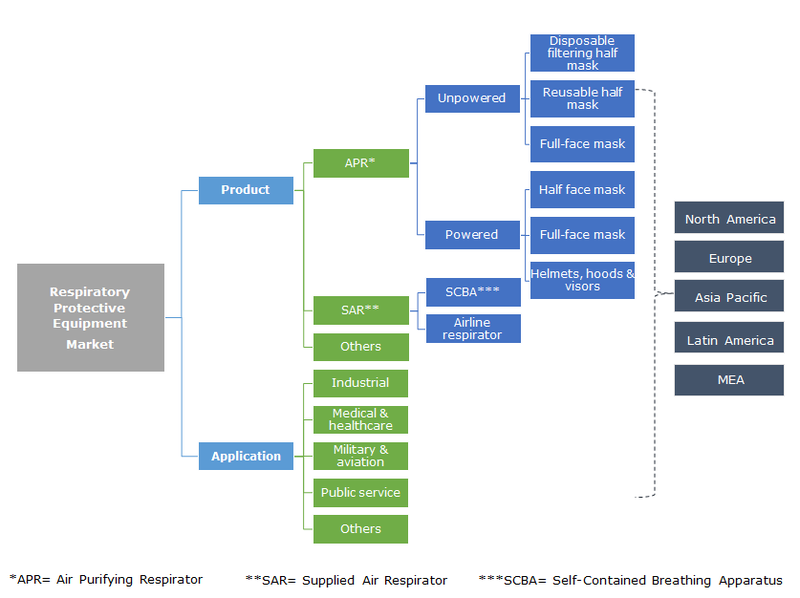 Air purifying respirator market size attained the highest industry share and is likely to grow at a CAGR close to 6.5% in the coming years. These equipment are used by workers in an environment where the air is polluted by fumes, smoke, vapors, dust and other harmful gases. It provides breathable air through masks, hoods, visors and mouth pieces to remove air contaminants. They are further divided into unpowered and powered air purifying respirators. Unpowered air purifying respirators are further categorized into disposable half mask, reusable half mask and full-face mask respirator which works on the breathing action of the wearer or through a long breathing hose that is secured in a clean environment. Powered air purifying respirator is categorized into half face mask, full face mask and helmets, hoods & visors, which takes polluted air or pathogen and filters a substantial proportion of these hazards, and delivers the clean air to the user's face or mouth. 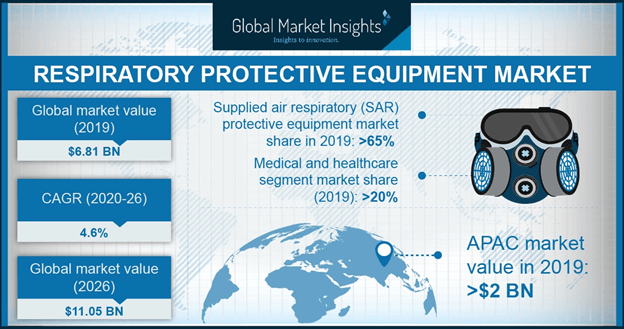 Respiratory protective equipment market size for industrial applications has attained a major chunk of the overall industry share and is projected to rise at a CAGR close to 7% in the forecast span. This has been majorly attributed to its application across oil & gas, chemical manufacturing, construction, mining, marine, sports & entertainments, metal fabrication, aerospace, agriculture, textile, pulp & paper and food industry for maintaining health and safety standards at the work place which will help attain promising gains to the respiratory protective equipment market size by 2024. Respiratory protective equipment market size for public service was valued over USD 180 million in 2016. They are used for non-industrial firefighting by the professionals to safeguard life’s in emergency situations. Fire service professionals usually carry Self Contained Breathing Apparatus (SCBA) where in air tank is carried by them to overcome oxygen deficient atmospheres at the fire site to perform their duties effectively. Asia Pacific market size is the fastest growing segment which is likely to grow at a CAGR of over 8% over the projected timespan. Rapid industrialization in the region along with consistently improving occupational health & safety standards are likely to be the major contributors for the respiratory protective equipment market size during the forecast span. Moreover, substantial investment in the military & aviation sector in the region to develop progressive equipment to ensure the health & safety of working professionals will also contribute to market size in the coming years. North America respiratory protective equipment market size was valued over USD 1.5 billion in 2016. This is credited to strong growth indicators in medical & healthcare industry which has resulted in propelling demand for respiratory protective equipment to effectively treat patients under critical health situations. In addition, stringent OSHA standards in the region is a major factor responsible for boosting product demand which will subsequently help attain significant respiratory protective equipment market size during the forecast period. Major respiratory protective equipment industry share contributors are 3M, Alpha Pro Tech, Mine Safety Appliances, Honeywell International, Inc. RPB Safety, Bullard, Delta Plus Group and The Gerson Company. Major industry players are actively engaged in forming strategic alliances to achieve competitive advantage in the market. For instance, 3M acquired Scott Safety from Johnson Controls in March 2017, for a deal value of USD 2.0 billion. The move was intended to strengthen company’s personal safety portfolio, with Scott Safety’s expertise in self-contained breathing apparatus (SCBA) systems, gas and flame detection instruments, and other safety devices. Respiratory protective equipment is primarily used by workers while working with toxic substances including gases, powdered chemicals, solvents and sprays. They are available in the market in several forms including helmets, face pieces, visors, hoods and masks. Rapid industrialization along with consistently improving occupational health & safety standards in Asia Pacific will help attain substantial gains in the respiratory protective equipment market in the coming years. Stringent OSHA standards in North America and Europe will help boost product demand during the forecast period. LATAM and MEA industry share is likely to rise at a faster pace owing to growing industrialization over the projected timespan.